If there's one thing that job seekers can attest to, is that: knowing what;'s what when it comes to writing an attention-grabbing CV/Resume can be a mindfield, to say the least - mainly because the rules of the game are forever changing, and no one can ever fully know what's what, especially people like new graduates who are eagerly anticipating entering the job market or indeed, career-changers who haven't had to write a CV'Resume in the last couple of years can be at a loss when it comes to knowing the write way or the wrong way to craft a great CV/Resume as CV/Resume writing trends are forever changing. And 2017 and indeed 2018 is no exception. So to help all you eager job-seekers, today's post is going to share the top most CVResume writing trend for 2017 which are set to continue-on in 2018 too. So what are the key CV/Resume writing trends that you as a job seeker must be aware of? It's a long established fact that recruiters and hiring Managers alike only spend a measly 6 seconds before they decide whether you're on to the next stage of the job application process or not.Which is why, making your CV/Resume skimmable is a must if you want to maximize your chances of landing an interview. Ensure that your name is written across the top page of your resume in a larger font so as to make it a point for the reader to remember who's resume it is they're reading. For the rest of the resume, use 12 point size for your fonts as it this instantly makes your resume more legible, making it easily skimmable. Use bullet points where appropriate. For example, when describing your previous achievements, use bullets points as opposed to full-on paragraphs. This will instantly enable the reader to get a sense of your achievements in a quick space of time. Building on the fact that your resume has to be skimmable, it will also help to aim to be 1 page long. A 1 pg resume length is a trend that is set to continue on in 2017 purely based on the simple reason that imployers are still spending less and less time reading Resumes, which is why job seekers are now making it easier for recruiters to go through their resume quickly by simply submitting a 1 page resume. Now, if you're going to adhere to this 1 page resume trend, it's still going to be important to ensure that it is skimmable, so don't cram all your information on 1 page just for the sake of it. If you feel like you still have important information to include in your CV/ Resume then don't be afraid to have a traditional 2 page resume. Its better to make sure all the important information is there rather than withholding it for the sake of having a 1 page resume. When reading a resume, Hiring Managers are consistently on the look out for proof that candidates are capable of delivering results, and aren't just saying fluffy words to make themselves look smart or accomplished. And its because of this that vague phrases like "results driven" or "responsible for ..." aren't as convincing anymore. So, if you want to convey to the Hiring Manager that you're "results driven", the best thing to do is to use action verbs and action statements to convey what you actively did in your previous roles so as to show how "results driven" you actually are! The easiest way to do this is to start each sentence with an active verb. For instance, lets say you increased sales in one of your previous roles, instead of saying: "responsible for increasing sales", you could use active verbs, AND, quantify them with metrics . So you could say something like: "actively increased sales from 123 to 456 by 10%"
Now, that would be a great way to demonstrate how "results driven" you are, don't you think?! 2017 down to 2018 is the year that your online presence will be treated as an extension of your CV/ Resume. So besides the expected LinkedIn profile as your online resume, recruiters will be extending their search onto your social media accounts. So do make sure that your social media accounts like Twitter, Facebook, Instagram, and Google+ are kept professional. The easiest way to do this is to treat them as a form of portfolio portal where you share your knowledge with your followers. This will not only make you look like a thought leader in your field, but it'll also enhance your Personal Brand drastically. Similar to treating your social networks as a sort-of extension of your CV/Resume, nowadays having a dedicated personal website, or indeed a blog is a fantastic way to prove your proficiency in your industry and not to mention a brilliant way to showcase that which you do best, plus... a personal website is the number 1 tool that you can use to perfect your Personal Brand and elevate it to the next level, and not to mention it's an amazing opportunity to create fresh content and show-off! And let me tell you, employers love to see a candidate who goes above-and-beyond their call of duty by creating a personal website because that shows initiative. So if you want to create your very own website but lack those necessary web-design skills, then I definitely suggest Weebly.Com as your go-to place! And here's the good news: there's loads of ready-made portfolio website templates out there for you to choose from, so it's not like a level 10 proficiency in website building is necessary for you to build one. If you want to create your own CV/Resume website, Sign Up Here with Weebly.Com. What I love about Weebly.Com is that you don't even have to pay for a website, you can create it for FREE! But to be honest, it's better to pay for one as it looks professional to employers plus it gives you the opportunity to have your domain name as yourname.com (example www.lindsaymalatji.com) as opposed to having your domain name as www.wix.com/yourname which just looks clunky and hard to remember. Premiums are as little as €7 per month for a CV/Resume website plus you get a FREE domain name as well, which, normally costs €20.00! 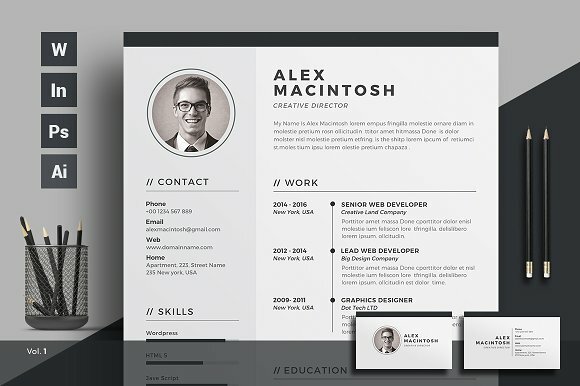 After Signing Up with Weebly, check out these 3 Personal Templates as I think they're the most appealing themes that you can definitely use as your CV/Resume personal website and increase your chances for getting that much-needed interview. Check out the "Susan Smith - Birdseye 2" Template. This template will be great for a candidate within Markerting, Graphic Design, Interior Design, Architecture, Fashion, Product Design, etc. as it also offers you the opportunity to showcase your portfolio of works. Secondly, check out the "Mandy Miller - Cento" Template, it's a responsive website and will be great for you if you are a creative like photographer, designer, etc. Fir more Website Template Themes To Choose From, Check-out this Weebly Theme Gallery! And there you have it - The 5 Most Trending CV/Resume Writing Tips of 2017 to be aware of before composing your CV/Resume. Want more Job Application Tips??? Head Over HERE! Great tips! I definitely need to work on making mine shorter and more skimmable! Awesome tips! I'm in need of a good resume revamp, and will definitely use some of your tips/tricks. These are great!! Very useful tips and information! Good to know! So true! I would recommend all these tips for someone job searching! Luckily, I learned all these in my business school and it helped me find my job. I think it helps to have a LinkedIn account too.